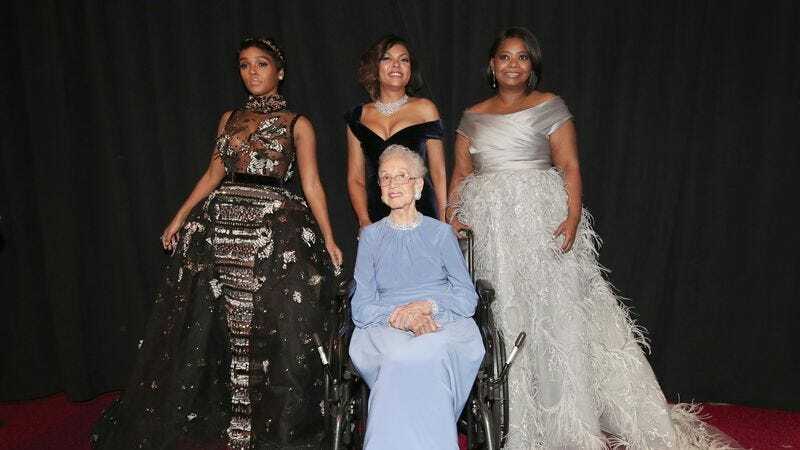 During the Oscars Sunday, the stars of Hidden Figures paid tribute to Katherine Johnson, one of the women who inspired the nominated film. Johnson, a renowned NASA mathematician, came out on stage with Taraji P. Henson, who portrayed her onscreen, Janelle Monáe, and Octavia Spencer. Hidden Figures, a box office hit, has helped raise the profiles of Johnson, Mary Jackson, and Dorothy Vaughan, but now Johnson is being immortalized in another fashion: blocks. According to the Associated Press, Johnson is one of the people featured in Lego’s new “Women of NASA“ set. The other scientists turned into toys include Margaret Hamilton, Sally Ride, Nancy Grace Roman, and Mae Jemison. STEM-lovers and admirers of awesome ladies will have to wait a while before they can purchase the collection; it won’t be available until either late 2017 or early 2018, the AP noted.